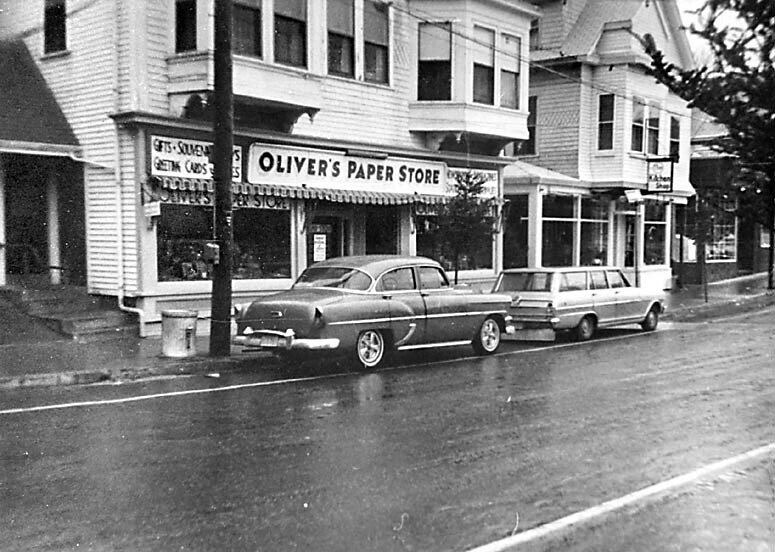 The following is a history of the buildings and businesses that have stood over the past century in the location of what used to be Oliver's Paper Store, the A&P, Charlie Call's china shop, Mrs. A. T. Tilton's dry goods store, and in recent years the Thrift Shop, on the west side of Main Street in Vineyard Haven, Mass. 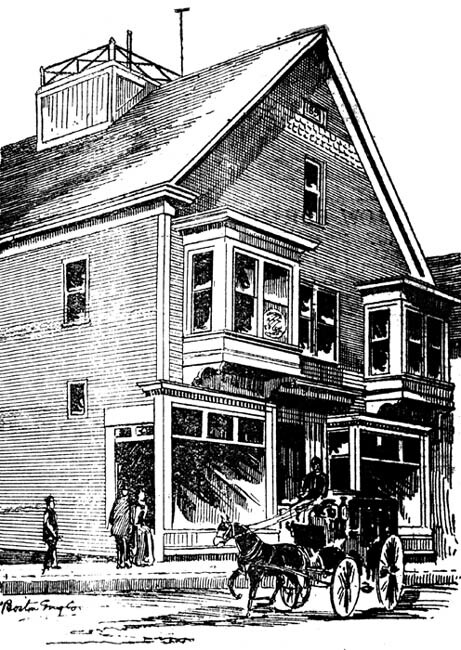 1891 illustration of Eagleston's "Boston Store"
Stan Lair said: "The next store was Aleta Tilton's - she was the wife of H. L. Tilton who ran the drug store further up the street. She had a dry goods store there. Later it was run by Charlie Call. Then it was an A&P store. It was a gift shop under a few owners, and it is now the Thrift Shop." This property was the southern portion of a tract of land owned by Isaac Daggett until 1800 when it was sold to Leonard Merry, who in turn sold it to Dr. Benjamin Trask in 1802. See Site #31 for more on these early pre-fire property owners. In April 1891 the Gazette reported that "Several new buildings will soon be erected. Mr. Eagleston and Mr. Coye have each purchased land north of Mr. Douglas' store, known as the 'Trask lot,' and will erect two substantial stores. The villagers are delighted that the empty space at the head of Wharf street is so soon to be a thing of the past." In August 1891 the Gazette reported "Workmen began this week to break ground for the foundation of the new store Mr. A. P. Eagleston, of the Boston Store, will soon erect on Main Street" and that Eagleston was "about to erect a large and commodious store on his lot, 35 feet front and 60 feet deep. Allen P. Eagleston (1855 - 1917) came to Vineyard Haven in the 1870s. He had entered the dry goods business at the age of eleven, and at the age of eighteen had opened his own business in Vineyard Haven. 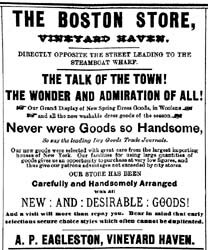 His dry goods store was on Main Street opposite the Mansion House in 1876 (see Site #___), and he called it the "Vineyard Haven Cheap Store," perhaps to differentiate it from the "Cheap Store" in Edgartown run by L. C. Bliss. In 1879 Eagleston moved the store one door north (next door to Hammond's barber shop, across Main Street from what was then the Post Office. See Site #___.) In the 1880 Tisbury census, Allen P. Eagleston was listed as a "dry goods merchant." " In 1882 Eagleston moved to Hyannis and purchased the dry goods business of George L. Thaxter. He named his new shop "The Boston Store" and maintained it until the spring of 1887 when he sold his business to Mr. P. M. Crowell. He may have also spent time living in his hometown of Salem during these years. A. P. Eagleston and his brothers Edward and James then moved with their widowed mother to Atlanta, Georgia, where in 1888 they opened the Eagleston Brothers dry goods store known as the "Bee Hive." In October 1888 the Atlanta Georgia Cracker reported (as reprinted in the Gazette): "[Eagleston] began a new era in the success of his life, opening the popular and extensive 'Bee Hive' in Atlanta, which to-day is a household word with every lady in the city and throughout the South. As a business man, his equals are few - superiors, none. It is said by many that no one crosses the thresholds of the New York and Boston markets that buys or owns their goods cheaper than Mr. A. P. Eagleston, the Prince of Buyers. His hosts of friends in Atlanta wish him and his brother the most unbounded success in the conduct of the magnificent and well-stocked 'Bee-Hive,' the headquarters for dry goods, made so through a determination to lead all competitors in newness of styles, reliability of goods and cheapness of prices." Their Atlanta business evidently did not last much more than one year. Allen and Edward returned to the island and in May 1889 opened the Eagleston Brother Boston Store (See Site #23). In 1890 Edward moved to Hyannis. In October 1891 the Gazette reported that "Mr. Eagleston's new store is fast nearing completion. On Monday the large plate glass windows were put into position." Later that month Allen Eagleston and his wife Mary secured a $1500 three-year mortgage from Presbury Smith on this property. In November the Boston Store held a sale "previous to our removal to the new store." In mid-November 1891 the Gazette described the improvements on the "Trask lot": "The south-east side is covered by a substantial block, built by Mr. A. P. Eagleston, and will soon be ready for occupancy. The upper rooms on the south and east sides are already occupied by the Government as a weather bureau. Mr. Eagleston will use the first floor for his dry goods business. This floor and the rooms already mentioned are finished in hard wood, and it was through Mr. Eagleston's efforts that Government has at last found more suitable quarters for business. The remainder of the building is lathed and plastered, and is well adapted for offices." 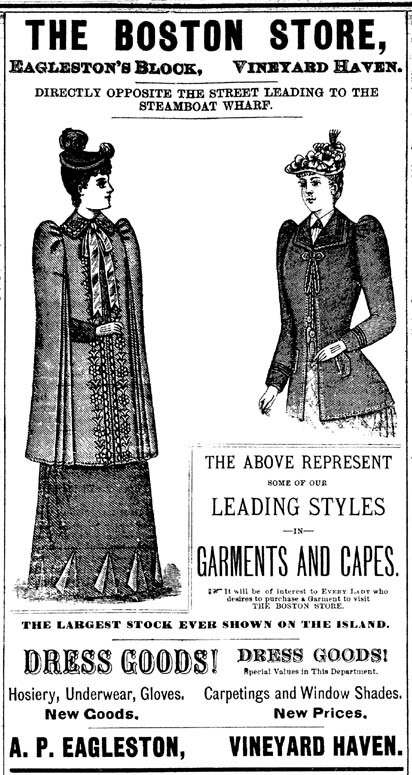 The Boston Store held its grand opening on Nov. 28, 1891, with a sale on "ladies and misses garments." In December 1891 it was reported that young Charles Call was clerking at Boston Store, and for the holidays Eagleston brought in extra clerks Miss Annie Smith, Mrs. Nora Staples, Wm. Kidder, and Fred Luce. In January 1892 the Boston Store advertised itself as a "Dry and Fancy Goods store" selling "ladies' garments" and "dress goods." 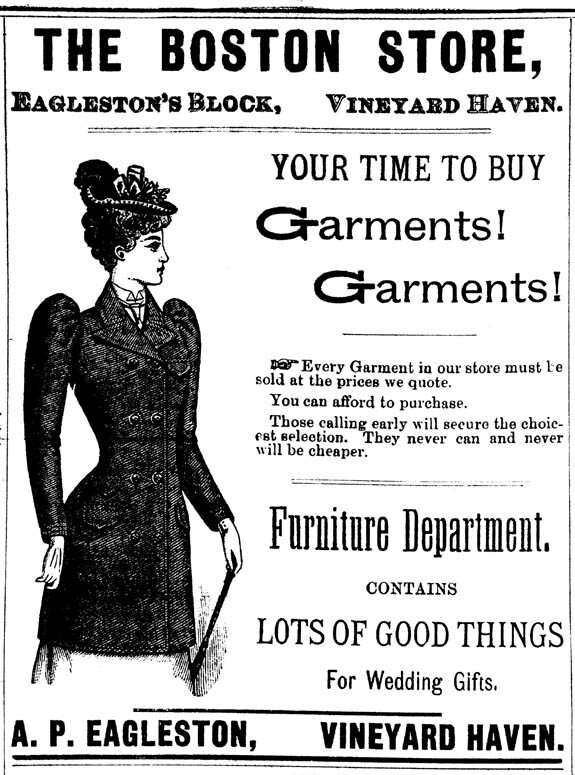 In August 1892 the paper reported that Eagleston was making improvements to his block, and that he was opening a furniture department in connection with his dry goods business. Contractor M. C. Vincent was hired to remodel the third floor of Eagleston Block for the new Boston Store furniture department. In October 1892 it was reported that Miss Bessie Gould was clerking at the Boston Store. 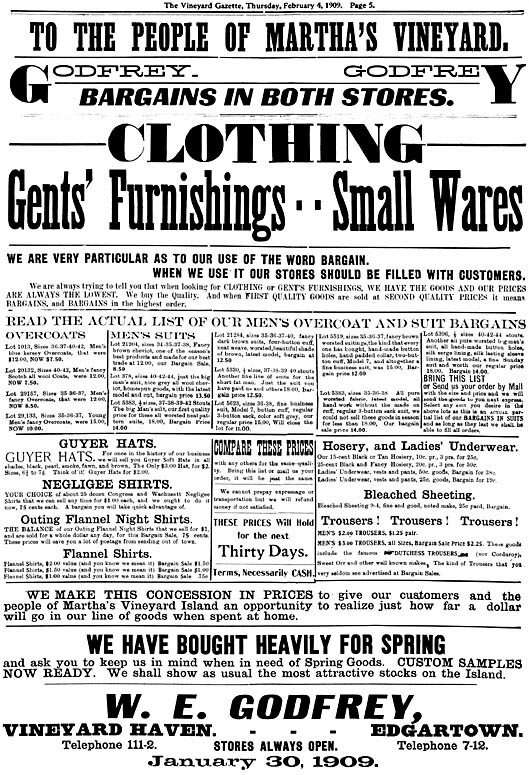 In March 1893 the Gazette commented on Eagleston's new signs which had been painted by Frank E. Leach, and in May 1893 The Boston Store advertised its 3rd Floor Furniture Department. In December 1891 the paper reported that Mrs. M. A. Newhavre had sold her millinery business to Miss Sophronia H. Davis "who will commence in the spring in Eagleston's new block." In October 1892 the paper mentioned "Millinery at Miss Davis', Eagleston Block" and December 1892 of "Miss S. Davis' Millinery Rooms." In July 1893 Miss Davis held a "closing out sale" of her millinery at her store in the Eagleston Block, and in November she moved her millinery goods to Mrs. David Butler's home on Spring Street. In September 1892 it was reported that Mr. E. G. Eldridge of Cottage City had leased an office in Eagleston's block, and worked here two days per week as a real estate and insurance agent. 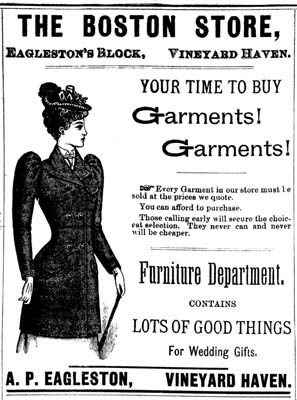 In June 1893 the Gazette reported that The Boston Store was closing, and that A. P. Eagleston was combining his business interests with his brother Edward L. Eagleston in Hyannis. The Boston Store held a "closing out sale" of dry goods and furniture. 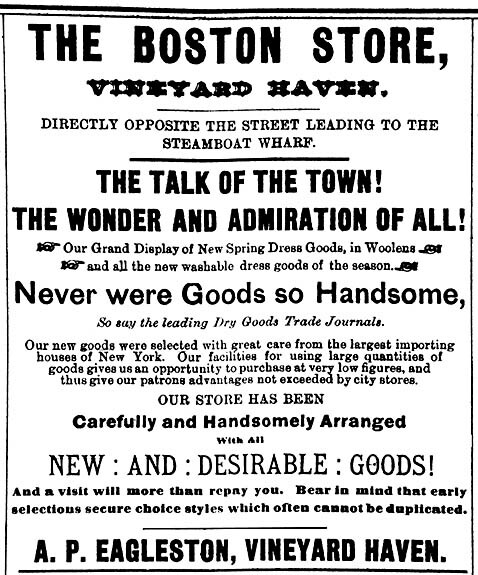 The Boston store officially closed on Aug 18, 1893. In October, Eagleston's employee Louis Rosskoff opened his own dry goods store in Mrs. L. T. Norton's former worsted store (see Site #___.) The same month A. P. Eagleston and his brother Edward opened a new furniture store in Hyannis. 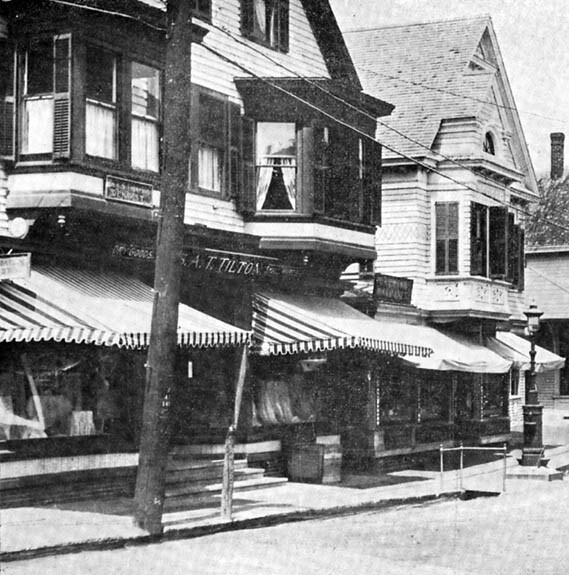 Edward Eagleston had been the proprietor of the New York Store in Hyannis since the fall of 1890. In July 1894 Allen P. Eagleston and his wife Mary sold this lot to Hyannis widow Hannah Eagleston (probably his Vineyard-born mother), and on the same day Hannah Eagleston sold the lot back to Mary L. Eagleston (Allen's wife.) It's unclear what the purpose of these transactions were. Likewise, in April 1907 A. P.'s wife Mary L. Eagleston "of Hyannis" sold this lot to Allen's brother Edward L. Eagleston of Hyannis, and on the same day Edward Eagleston sold the same lot to Allen P. Eagleston of Hyannis. Eagleston did not stay out of business in Vineyard Haven long. By 1894 he had opened a new dry goods store ("The New York Store") elsewhere on Main Street (see Site #___.) Meanwhile, the brothers' furniture business in Hyannis existed until at least 1907, having suffered a devastating fire in 1905 and rebuilt. In February 1910 Allen P. Eagleston sold this lot for the last time to William G. Manter. 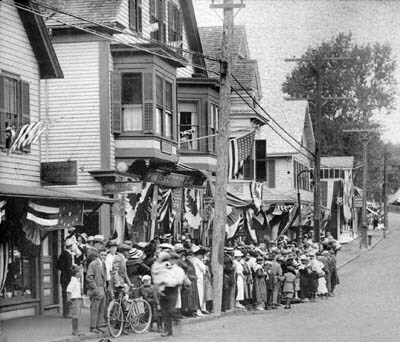 In his later years, Eagleston became involved in the movie theater business, including the purchase of the Capawock (see Site #9) and the establishment of the Eagle Theatre in Oak Bluffs. He died in 1917, and in 1920 his widow Lillian Eagleston married George W. Judkins. They continued to summer on the island as late as 1928. "On the right-hand side [of this building] was the official who received weather reports and here also was the telegraph office. From the roof of the building flew the weather signal flag. I can remember seeing the red and black flag that was a storm signal, but never remember seeing two of these flags flying which warned of a hurricane." 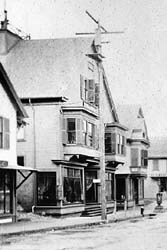 In September 1891, before Eagleston had even moved his own store into the new building, the Gazette reported that "The U. S. Signal Service office will be removed from the Mansion House about Oct 1st, to the business building of Mr. A. P. Eagleston, now nearing completion on Main street." The island's Signal Service operator at this time was William Washington Neifert (1865-1951). In 1893 Neifert was described as the local "Observer" for the Weather Bureau, U.S. Dept. of Agriculture.
. He never lost the spirit of inquiry or awareness of the times around him. Mr. Neifert was born in Rush Township near Barnesville, Schuylkill County, Pa., on Jan. 27, 1865, son of the late William and Lucinda (Lindner) Neifert, the youngest of nine children." Neifert enlisted as a telegraph operator in the United States Signal Corps in 1885. In 1886 Neifert was chosen, because of his ability to use a heliograph and his knowledge of meteorology, to command a party of "heliograph men" to assist in the "Apache War" in the Arizona mountains during the campaign to capture Geronimo. The following year he was assigned to manage a telegraph office in Fort Reno in the "Indian Territory" (which was to become "Oklahoma" during his stay there.) After short periods in Texas, Virginia, and Philadelphia, he was sent to Vineyard Haven in May 1890 to operate the cable which had been laid to the island by the government in 1885. Here he was discharged from the Army and appointed an observer for the Weather Bureau in the Department of Agriculture. His first office was in the Mansion House (see Site #15), before moving to the Eagleston Block in 1891. In April 1891 Neifert married Myra Fisher White of Vineyard Haven and New Bedford. 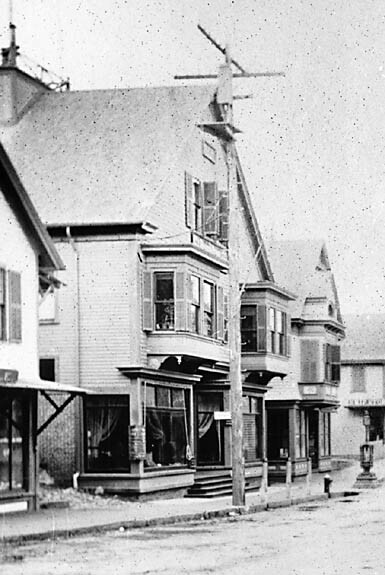 Although grocer Stephen Luce had installed the first telephone in Vineyard Haven in 1881 next door (see Site #29), and after the fire had managed a telephone system in his new store until 1886 and again after 1896 (see Site #32), for seven years the town's telephone system operated out of the second floor of this building. According to a 1938 Gazette article on telephones, "The first central office was in a room at the head of Union Street, in Vineyard Haven. This office was established about 1890 [sic.] when increasing demand made it necessary to have a main switching station and several circuits controlled by an operator." In October 1891 the Gazette was reported that a telephone connection to Gay Head was now in operation at the new office of the U.S. Signal Service. In February 1893 the Gazette announced "Telephonic Communication with Mainland." According to the paper (including 1943 and 1951 retrospective articles), George A. Hough Sr., city editor of the New Bedford Standard in New Bedford, and Weather Observer Neifert at Vineyard Haven had spoken on long-distance telephone - the island's first-such connection. Neifert had proposed the experiment to attach the government wire in his office to a long distance transmitter, while the telegraph operator at Buzzard's Bay connected the telegraph wire to the Southern Massachusetts Telephone Company's metallic circuit. The paper reported, "For the first time the voice of a man in New Bedford was heard on the Island." Railroad operator Mr. Bowley in Buzzards Bay assisted by connecting one wire of the New Bedford metallic circuit with the telegraph line from the Vineyard. 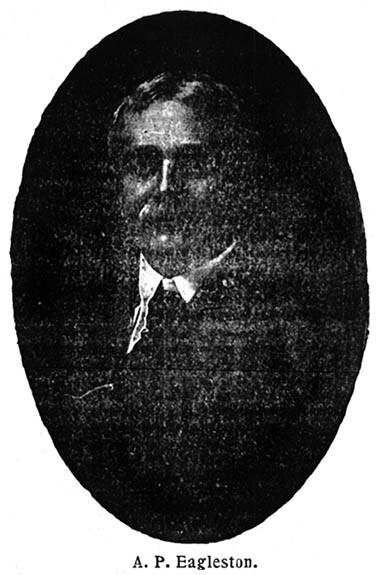 William W. Wagner of the New Bedford exchange also assisted. The paper went on to explain that the U.S. Signal Service telegraph line over which the conversation was held extended overland from Vineyard Haven to Gay Head, where it connected with a submarine cable crossing Vineyard Sound to Pasque, then to Naushon, then to Woods Hole, and then to New Bedford via Buzzards Bay and Tremont. 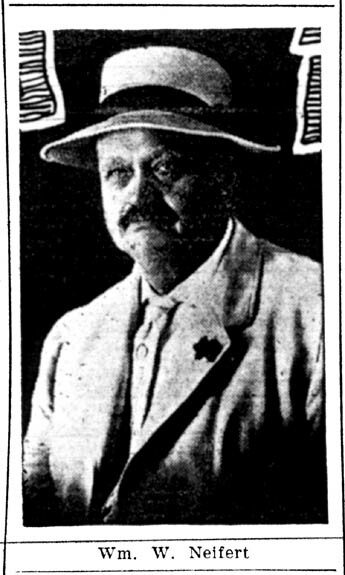 The Gazette also recalled in a 1951 article, "Mr. Neifert must have been a commanding figure when he came here, for he was six feet two in height and built accordingly. For six and a half years Mr. Neifert was in charge of the Weather Bureau station here, and during the Spanish American War he had full responsibility for military telegraph and sea coast cable lines to the Island." While maintaining his position at the telegraph office and as weather Bureau observer, Neifert evidently also ran a small retail business on the side. In April 1894 he advertised electrical supplies with "telephone and call bells a specialty" as well as "foreign and domestic postage stamps." 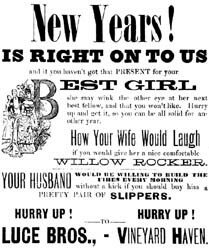 In January 1895 he also advertised "telephones and call bells put up." "I can remember the first time I ever listened to a telephone, oh I suppose 1895, something like that. I don't know how long they had had them. In that building where the Thrift Shop is, in the center of the building, you went in and there was a big staircase that led right upstairs. The store was all around it, but it led upstairs, and upstairs on one side was a man who had charge of the weather. They used to have signals, you know, for what kind of weather they were going to have. And also so this man had a telephone. And he said to me, he got a message, someone rang him on the telephone, and I was so interested. He said, 'Would you like to listen too?' And I said, 'Yes!' So he let me listen and you see it was somebody in New Bedford talking to somebody in Nantucket about some fish. It wasn't very interesting, but still it was very exciting. And across the hall from him was the customs officer. We used to have a customs officer here. Seems strange, doesn't it now that we would have it. But I think that must have been about, oh 1896 perhaps." In November 1896 the Gazette reported that "The Telephone Exchange has moved from its room over Luce Bros.' store into Mr. Stephen Luce's store, corner Church and Main streets." (See Site #32.) However, the telegraph office evidently remained at this location. In January 1897 the Gazette reported that government weather observer Neifert had been ordered to Nantucket to take charge of the station there. From there he was transferred to Boston in 1902, and from Boston to Hartford. He continued to visit the island on occasion. W. W. Neifert died in March 1951 at the age of 81. "Mr. William W. Neifert was retired at the termination of April 30, 1933. He was born at Barnesville, Pa., on January 27, 1865. He enlisted in the Signal Corps November 27, 1885; after the usual period of instructions at Fort Myer he was transferred to Fort Bowie for a short time; later he served as assistant or official in charge at Fort Reno, San Antonio, Palestine, Brownsville, Norfolk, Philadelphia, Vineyard Haven, Nantucket, Boston, Hartford, Dayton, and Binghamton. At the time of his retirement, he was in charge at Binghamton." About 1900 the two telegraph companies, Postal Telegraph Co. and Western Union Telegraph Co., jointly bought the telegraph lines from the government who up until then had owned the cables to the mainland. The two companies merged to become the Martha's Vineyard Telegraph Company. This was also the year that a telephone cable to the mainland went into operation, ending the experimental use of piggybacking telephone calls on the telegraph lines. The 1900 Vineyard Haven census lists 29-year-old Carleson(?) J. Doherty as the "telegrapher" at the U. S. Government Weather Bureau, as well as George C. Golart (1874- ____) as the "clerk" at the U.S. Weather Bureau. In June 1902 Carl Kruse hired by telegraph office, and in September 1902 Marston Flanders was employed as a messenger by the Western Union Telegraph Company, whose headquarters continued to be in the "Eagleston Block." In May 1903 the Gazette reported that Mr. Chapman from Provincetown was the new telegraph operator, and that "Miss Josephine Wright, who has been in charge of the telegraph station about a year has removed to Woods Hole as a permanency." By July 1903 the Martha's Vineyard Telegraph Company had moved its Vineyard Haven office into Lane's Block (see Site #5.) Its General Manager was listed as H. G. Haddon of Woods Hole. 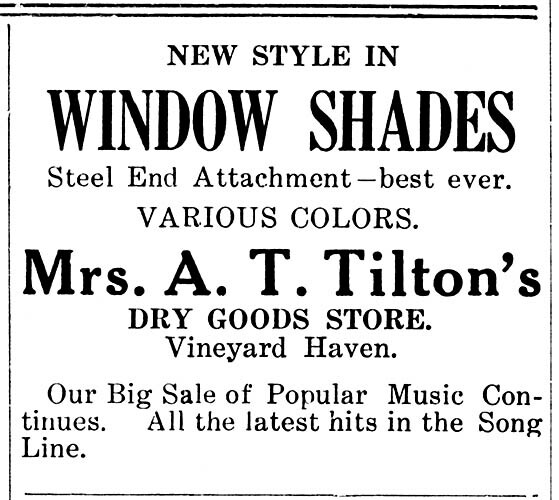 In September 1903 a "for rent" ad appeared: "Eagleston Block, Vineyard Haven - for rent, front room and connecting room, formerly used by the Telegraph Co. Overlooks the harbor. 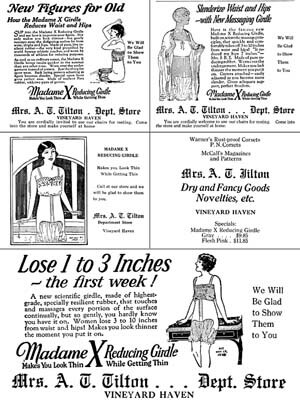 Apply to Miss J. Annie Smith at the Eagleston Shop." 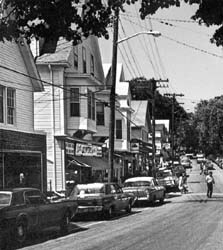 Gratia Harrington, in a 1967 article for the Gazette, wrote: "As the largest store on Main street it was considered a very fine and ambitious undertaking. Capt. Barnard Luce was the owner, another whaling captain, of short and stocky build. Several of the whaling captains whom I remember were small men. They must have had a great deal of force of character to rule their ships to the extent that whaling captains were forced to do. "The Vineyard people did most of their buying on the island and a dry goods store had to carry a varied and large stock. Captain Barnard's fine big store was very popular and well patronized. As one entered the building, the entrances to the store were to the right and left, and in the center was a broad staircase leading to offices on the second floor. On the left side at the front, its windows commanding a good view of the harbor, was the U.S. Customs office with Capt. Lorenzo Luce as customs officer." 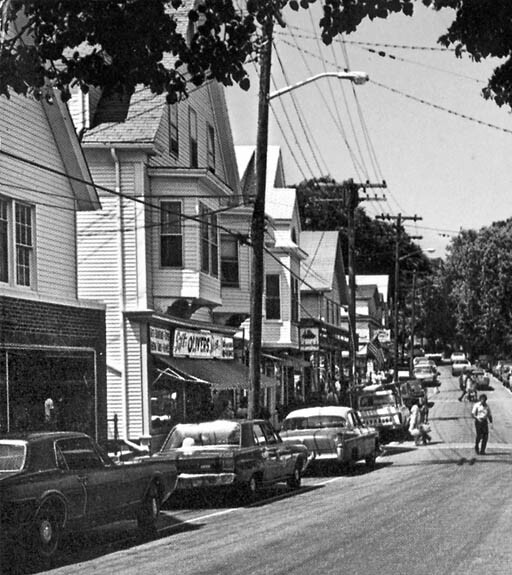 "Haines' Gift Shop, where Union Street comes into Main, was a big store in the old days. It was built [sic.] by Captain Barnard Luce, a retired sea captain, and made into a dry goods store. There were no ready-made clothes, of course. In the middle of the store building there was a stairway to the second floor. On one side of the upstairs was the telephone. Father was a friend of the telegrapher, whose job at that time was most important. He offered to let me listen in, and I did. A man in Nantucket was talking to a fish dealer in Woods Hole. Terribly exciting! It was run by Capt. Lorenzo Luce, a great uncle of Stephen Carey Luce, but no relation to Barnard Luce." 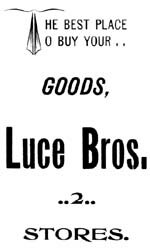 The Luce Brothers store on the other side of Main street sold gentlemen's furnishings, boots and shoes; this new store, leased from Eagleston, sold "dry and fancy goods," mostly for women, as well as furniture. 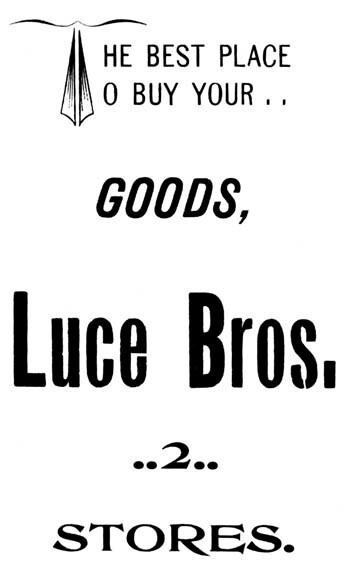 That fall the Luce Bros. printed enormous advertisements in the Gazette for their new store. They retained the name "The Boston Store" for several months. The Luce Brothers, Capt. Barnard Luce (1832 - 1898) and Presbury Sherwood Luce (1852 - 1937) were the oldest and youngest sons of Tisbury shoemaker Timothy Luce (1806 - 1889) and his wife Joan (Norton) Luce. Capt. Barnard Luce specialized in dry goods, and Presbury in shoes and clothing; Bernard managed the store at this location, and Presbury the store across the street. It is likely that Barnard's son Dean Sherwood Luce (1876-) also worked at this store from a young age, as he later took over the business. Although it's not known who worked at which branch of the store, Mrs. Thankful Tilton and Mr. Josiah Bodfish were known to have worked for Luce Bros. in 1889, as did Lillian May Hillman in 1895 and Miss Bessie Gould during 1895-9. 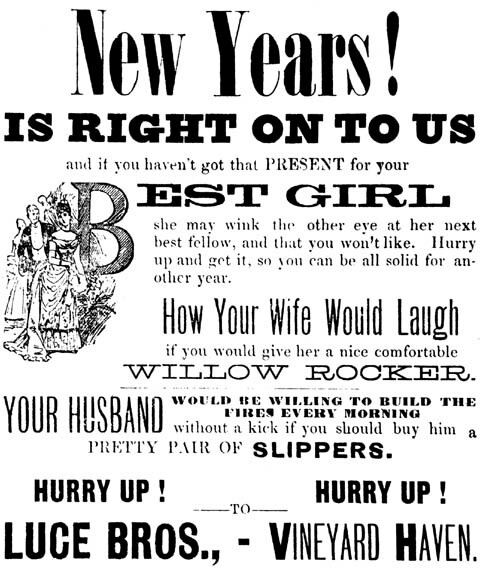 In November 1893 the Luce Bros advertised hair mattresses; and in January 1894, furniture and ladies' and misses' garments. 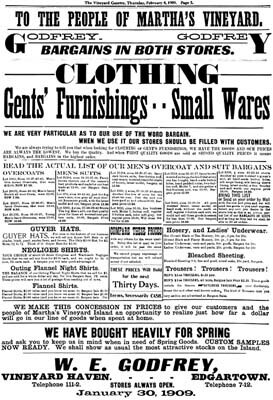 In 1897 they billed the town for the purchase of some clothing. In January 1894 and January 1895 a business calling itself "The Bostonian" advertised "Piano, Organ and Sewing Machine Parlors" in Eagleston Block. By December 1897, Dean S. Luce was helping manage the business at this location. Luce was born in Holliston, the son of Capt. Barnard C. Luce and the grandson of R. W. Coffin (see Site #27), and had come to Vineyard Haven as a child. 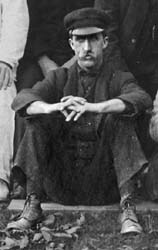 In 1894 and 1895 Luce had been listed as a student at Phillips Academy at Andover, and in May 1897 as a student at Harvard. In December 1897 the paper referred to him as "a certain Harvard ex-'00." According to a 1950 article, Dean had entered Harvard with the class of 1899, but had to leave at end of his sophomore year after his father's death to take over management of the store. Three years later he entered Harvard Medical School, and commuted between Cambridge and Vineyard Haven to manage the store. In 1898 Barnard Luce died, and in October of that year the paper reported that "Luce Brothers have consolidated their two stores, occupying the larger one known as the Eagleston block." In December 1898 the paper reported that Helen Tilton was clerking at Luce Bros. for the holiday, and in January 1899 that Miss Bessie Stanton had resigned as a clerk at Luce Bros.' store and that Miss Mabel Bodfish was clerking in Luce Bros. In February 1899 the paper reported that Miss Bessie Gould was clerking at Luce Bros., but in May 1899 that Miss Emma Chadwick had been hired as the summer clerk, replacing Miss Bessie Gould. In June 1899 Emma Luce was clerking for Luce Bros for the summer. In March 1900 Miss Bertha Cook took Miss Bessie Gould's place as a clerk at Luce Bros.' dry goods store. Luce Bros. clerk Bertha Waterman Cook (1862-1917) was born in Provincetown, the oldest daughter of Capt. Harvey S. and Charlotte Cook, and the sister-in-law of Dr. Thompson who had his office upstairs from the store (see below). Her obituary states, "Miss Cook was a very simple and quiet in her tastes, her attractive home and the culture of rare plants being companionship for her in large measure. Her lovely garden was a great delight not only to herself but to hundreds of passers by." She died in 1917 at the age of 62. By January 1901, Dean Luce was attending Harvard Medical School, and managed his store from afar. In March of that year the Gazette reported that he was in town "looking after the interests of his business." He was again listed as a medical student at Harvard in July 1902 and May 1903. He interned at the Long Island Hospital, received his M.D. degree in 1904, and began his practice in Canton in 1905. In February 1905 Luce married Ethel May Bense of Canton, the daughter of William H. Mense of that town, and in April and May of that year there were references in the paper to "Dr. Dean S. Luce of Canton, Mass." The 1906 Tisbury town report lists payments made to Dean S. Luce & Co. for providing articles for the town's poor, as well as desks, chairs, and a letter press stand for the town. In January 1906 Mr. William Barry Owen rented an office in the Eagleston Block for the management of his poultry business. In December 1906, Dean S. Luce & Co. were advertised as dealers of Luxemoor Leather products, made in Owen's short-lived factory behind the bank. 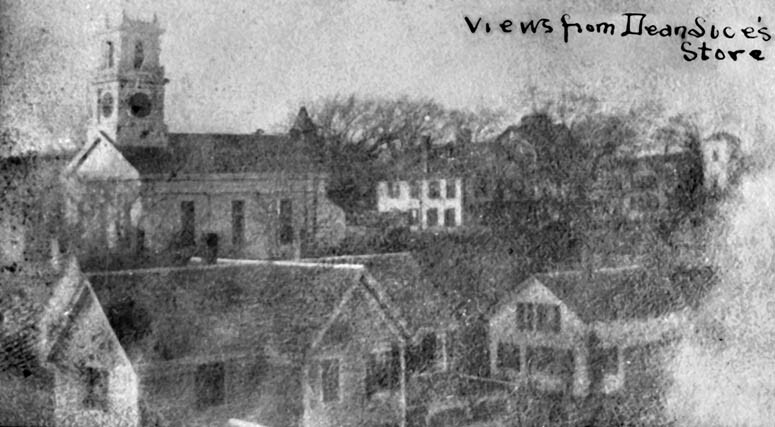 Snapshot taken by Dorris Hough from the roof of Dean Luce's store, looking northwest toward the Methodist Church, c. 1904-5. 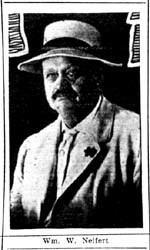 Dr. Dean S. Luce of Canton continued to make occasional business trips here, and in September 1907 the paper printed a rumor that "the long established firm of Dean S. Luce & Co. is soon to be dissolved and the business to change hands." Dr. Luce's uncle Presbury Luce finally closed this branch store and moved all of the family business interests back across the street by April 1908, and in September 1915 Presbury S. Luce ("doing business under name Luce Bros.") sold everything to Holmes Luce & Co. of Boston, and retired. In January 1908 the Gazette reported that "The 'Driving Association' a gentleman's club, has taken a large room of Mr. Eagleston over the present Dean S. Luce & Co.'s store, where it will hold business meetings." Dr. Dean S. Luce spent the rest of his life as a resident of Canton, Mass. In December 1950, the American Medical Association named Dr. Luce "Family Doctor of the Year" at their meeting in Cleveland. Dr. Luce died in April 1953 at the age of 77. Walter Renear said: "The window that bulges out - the dental chair was right in the middle of that window. Supposedly the view from the window would distract you. There must have been Thompson - Watkins - Lynch - at least three, maybe more, dentists. It must have been an ideal dentist place!" "There were several dentists in this building here. There was a stair that goes up the - still does - goes up the side of the building? You look out from the street, you find that set back slightly there's a door that goes upstairs. It's still there. There were two or three dentists up there, including, the last one I recall was Dr. Lynch. Dr. Lynch also was a competing undertaker with my father. Well, anyway, when Dr. Lynch didn't have any business, any customers, he used his drill to carve wooden buttons. Make wooden buttons and make holes in them, and carve them. That was Dr. Lynch. He actually lived in Oak Bluffs, just over the bridge on the left hand side." In May 1895 Dr. E. H. Chase, dentist, advertised his services in his summer office at the Eagleston Building as well as a second office in Oak Bluffs. He left in September, but in July 1897 the paper reported that Dr. Chase was to resume practice here, although it's not known whether he returned to this building. In November 1899, January 1900, and January 1901, Dr. Edwin S. Thompson, dentist, advertised at Eagleston Block. In November 1905 he announced his wedding engagement, and the paper noted that he had "made his home here for several years." 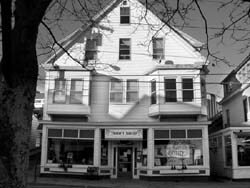 The 1907 Vineyard Haven directory lists Dr. Thompson, dentist, at his office on Main street opposite Union street, and his office hours were given as 9 to 12 am and 1 to 5 pm. Dr. Thompson may have moved his office into Lane's Block (Site #4) in later years. Dr. Edwin S. Thompson M.D. 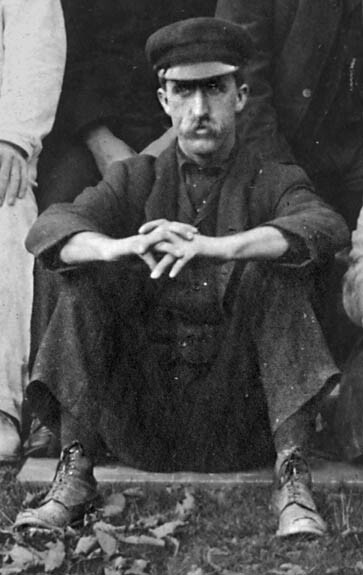 (1872-1944) was born in South Portland, Maine, the son of Edwin Thompson and Ann E. Gikles of Tisbury and Dartmouth. He graduated from the Harvard Dental School and then came directly to Vineyard Haven where he was a practicing dentist for about thirty-five years. He married Clara H. Cook (c.1879-80 - 1948), the daughter of Capt. Harvey S. Cook and Charlotte N. Hooton, and the younger sister of Bertha Cook who worked downstairs for the Eagleston Brothers. Dr. Thompson served as selectman for nine years, and as one of the food administrators in the first world war. In his retirement, Dr. Thompson and his wife established the Menemsha Inn in Chilmark. He died in Medfield in 1944. Dr. Paul Lynch (c.1874-5 - 1938) reportedly had an office here for a few years until he moved into Lane's Block (Site #4). 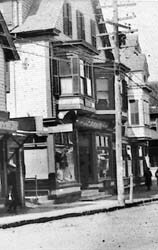 In July 1936 the Gazette reported that two office rooms on the second floor of this building (by this time known as "Call's Block" - see below) had been rented to Dr. H. Eugene Watkins, a dentist, of Worcester and Vineyard Haven. He was still at this location in February and July 1937. In November 1940 Dr. Watkins moved his dental parlors from Call Block to Lane Block across the street, into the former offices of Dr. Paul Lynch. "I remember going to him. He used to have a hobby of carving wood. People were in the waiting room and they'd hear this waaaaaahaahhh. He's there grinding away at a piece of wood. He made little animals or whatever." "He used to live across the street from me, on Centre Street. He was a nice old gentlemen. He went over to Lane's Block. I remember once one time we were playing baseball, and they hit the ball and it smashed his window in the basement. I tried to put a piece of glass in and the window broke. I got it fixed somehow, I don't remember exactly how. He was okay!" In March 1908, Wilfred E. "Fred" Godfrey (c.1874-5 - ?) printed a "Special Announcement" in the Gazette stating that he was about to move his store into the Eagleston Block. (See ad, right.) Since 1902 Godfrey had operated a men's clothing store two doors down (see Site #28). In April 1908 the Gazette reported that "Mr. W. E. Godfrey has moved to the store formerly Dean S. Luce & Co.'s, and Mr. Presbury S. Luce has moved his furniture department into the Lane block." 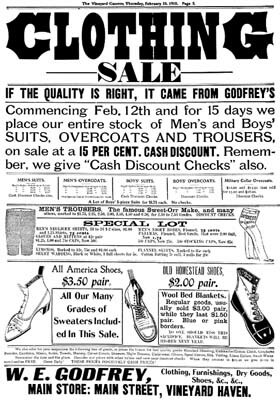 In May 1908 the Gazette printed another "Special Announcement" advertising "W. E. Godfrey, One Price Clothier," at the Eagleston Block. 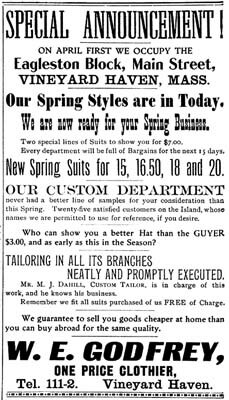 Godfrey's firm sold suits and hats, and Maurice J. Dahill (c.1852-3 - ?) was employed as his "custom tailor." 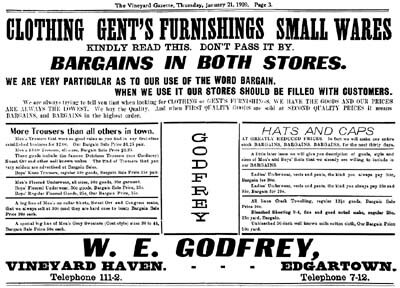 In October 1908 Godfrey's ran an advertisement for suits, and in November "W. E. Godfrey, The Vineyard Clothier" opened a branch store on Main Street in Edgartown. 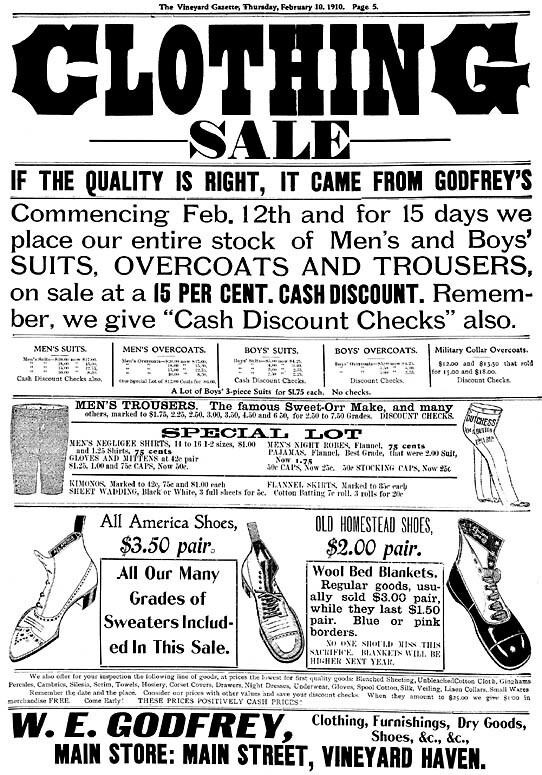 Godfrey ran advertisements for men's and boy's clothing, gent's furnishings, and small wares in both of his stores during 1909. 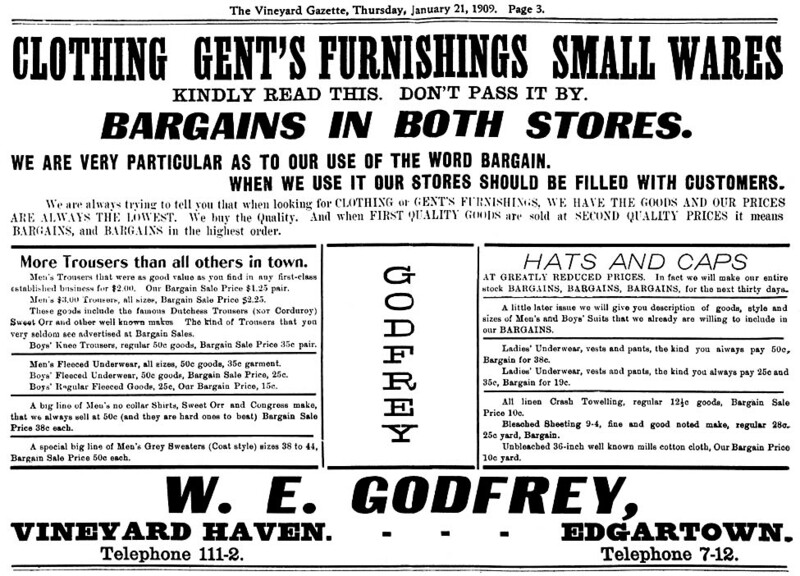 In February 1910 Godfrey advertised clothing, furnishings, dry goods, and shoes at his Main Street Vineyard Haven store only, but by April 1910 Godfrey was advertising both stores again. Wilfred E. Godfrey is listed in the 1910 census as a 35-year-old retail merchant of men's clothing, together with his wife Nell, their six-year-old son Elbert, and his mother Lucy. In February 1910, A. P. Eagleston of Hyannis sold this property to William G. Manter of Tisbury. The same month, William G. Manter sold the property to Josiah P. Bodfish, and the Gazette reported that the Eaglestons had sold to Bodfish the block "where the Customs house is located and stores and offices." In July, Godfrey printed an enormous advertisement declaring "Building Sold Over Our Head." He stated that the store had been sold to his competition even though Godfrey held a lease from A. P. Eagleston which was good until March 1, 1911. He added that this was "the second time in the history of our business in Vineyard Haven that the same party has bought the building which we occupied." (See Site #28.) A rumor was reported that an unnamed Vineyard Haven man was planning to build them a new store. 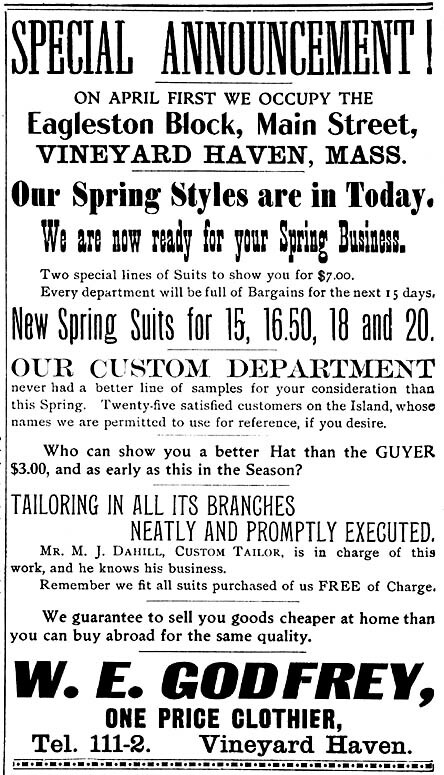 M. J. Dahill continued to be listed as Godfrey's "custom tailor," and in September 1910 W. E. Godfrey continued to advertise dry goods, clothes, and furnishings, at both Vineyard Haven and Edgartown locations. Joseph Allen wrote: "Josiah Bodfish was a very large man who conducted a dry goods store in Vineyard Haven. When business was slack, he would sit in on of his display windows in a large, comfortable chair, and crochet lace. He was known as an expert lace-maker." In January 1911, the Gazette reported that Josiah P. Bodfish, who had just bought this property, was moving his dry goods store into his recent purchase "where Mr. Godfrey now is." Since 1907, Josiah Parker Bodfish (1854 - 1913) had managed the store two doors to the south - see Site #28. In January 1911 the Gazette made a reference to the "good appearance" of Bodfish's new store, although the paper also noted that "Bodfish [is] not in good health." obliged him to retire about one year ago [1912.] He was esteemed for his business integrity, for his gentleness and courtesy." Bodfish's widow, Mrs. Lucy P. Bodfish, inherited the property. Mrs. Aleta Thomas (Robinson) Tilton (1870 - 1933) was born "Hannah Rose Crosby" in North Orland, Maine. She came to the Vineyard at the age of three, and in March 1873 she was legally renamed "Aleta Thomas Robinson." She was raised by Tisbury mariner Thomas M. Robinson and his wife Laura Crosby of Edington Maine. (Perhaps one of Aleta's birth parents was a near relative of Laura's? Aleta's 1933 death record also mentions a sister Laura Mumler of North Orland, Maine.) Thomas appears as a "seaman" and Laura as a "tailoress" in the 1865 Tisbury census. Thomas died in January 1876, and young Aleta was raised by her widowed mother. 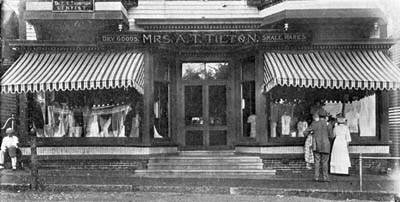 The 1920 Tisbury census lists the 49-year-old Aleta T. Tilton as a retail dry goods store merchant with her husband, "druggist" Herbert L. Tilton. 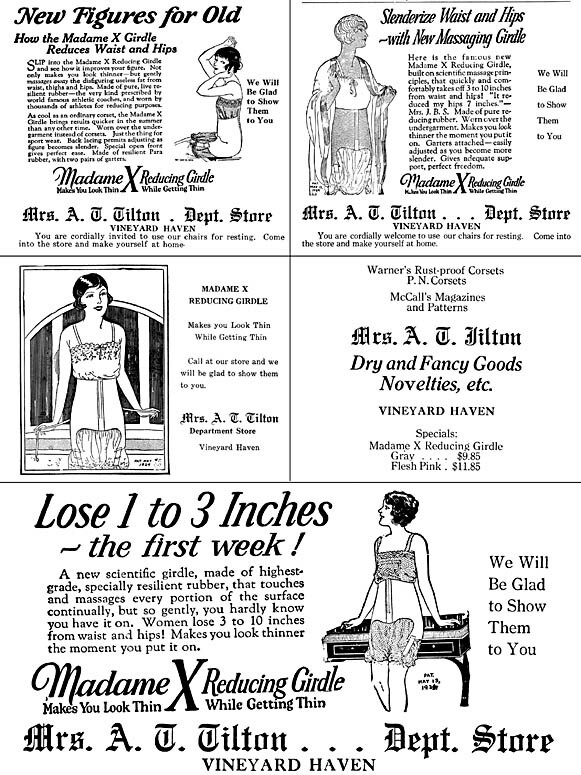 In July 1925 Mrs. Tilton advertised sheets and pillow cases. Connie Leonard said: "Next to Mr. Tilton's hardware store, right across that little pathway that goes up there across from where the Thrift Shop is was Leta Tilton's dry goods store. She was the wife of Herbert Tilton that ran the Tilton's Drug Store. She had a nice dry goods store there. And then later, when she retired, Charlie Call took it over and he sold dishes and all sorts of stuff." Rose Gouveia said: "Where the Thrift Shop is today, when I was a little girl that belonged to Aleta Tilton. And it was a dry goods store. You bought material by the yard and thread and patterns and yarn, everything in there." In March 1926 the first floor of the building was divided into two stores, and Mrs. Tilton's store, which previously had filled the entire floor, now occupied only half its former space. 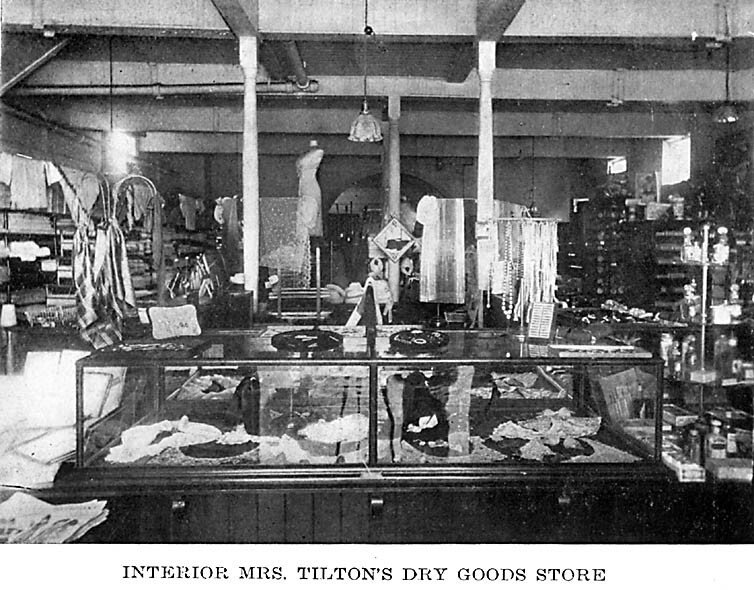 The Gazette wrote, "Mrs. Tilton will continue in business in one part, which has already been redecorated and fitted." Charlie Call's new store now occupied the other half of the storefront (see below.) 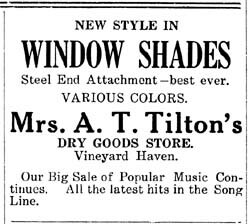 Throughout 1927, Mrs. A. T. Tilton continued to advertise her "dry and fancy goods." In February 1928 Mrs. A. T. Tilton formally opened her new dry goods store next door (Site #29). She also advertised a branch store in Edgartown. Circa 1913-1919. Israel Issokson is the man with the cigarette standing behind the bicycle. 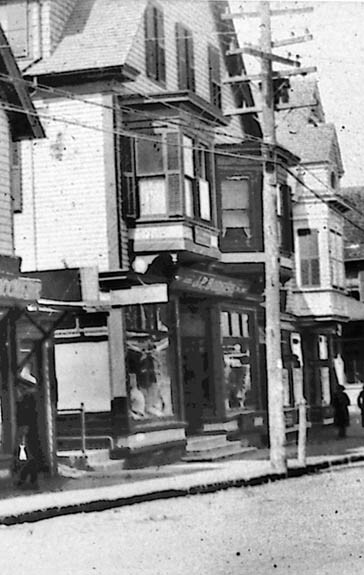 In March 1926 the Gazette reported that "Charles F. Call has recently completed the alteration to his Main street store building by which the first floor, formerly occupied by Mrs. A. T. Tilton, is now divided into two very pleasant and attractive stores. The other half of the building will be occupied by Mr. Call, who will carry a line of hardware and house furnishings." Charles Francis "Charlie" Call (1877-1957) was born in Tisbury, the son of carpenter Charles Call of Pittston, Maine and his wife Alice C. Luce, who was the daughter of grocer Warren Luce of Tisbury (see Site #35.) The elder Charles Call died when young Charlie was not yet three years old, and in 1886 Alice married Tisbury laborer Augustus H. Chesborough. Charles' older brother Wilbert took over their grandfather's grocery (Site #35), but by 1900 Charlie had become a plumber. By 1909 he was advertising as an Edgartown plumber, and the 1910 Edgartown census lists 32-year-old Charles Call as a plumber and tinsmith. In 1910 he married Lina Davis. 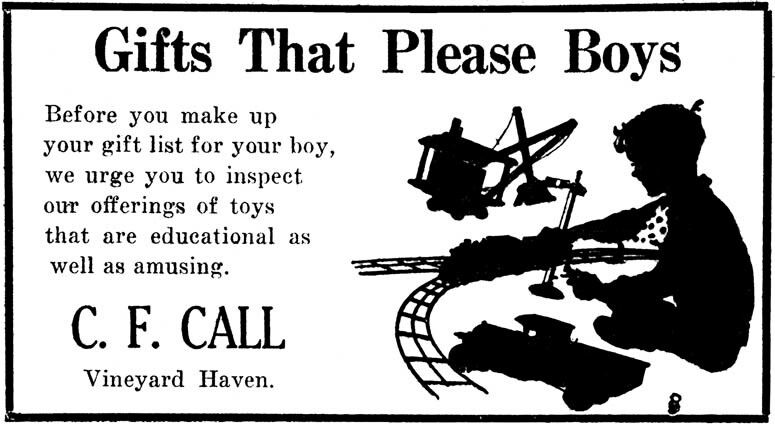 In July 1926 the Gazette admired a model schooner displayed in the window of "Call's China Shop," and in December 1926 an ad appeared for "Call's Toy Store." In April 1927 the 'Round 'Bout Tisbury column mentioned that there were "so many teapots, coffee pots, and pitchers in his store that it makes a person thirsty to look at them." In April 1927 the paper mentioned a radio cabinet in Call's store built by Maurice Belain of the Tisbury High School carpentry course, and in May 1927 that new gold letters had been put on Call's window. In July 1932 the 'Round 'Bout Tisbury column referred to Main Street merchant Charlie Call "with the invariable cigar." In November 1929 it was reported that Mrs. John Palmer was clerking at Mr. Call's store, and in December 1930 that Miss Pearle Sears was clerking at C. F. Call's store through Christmas. Barbara Donald said: "Charlie Call. I remember going in there the day I was going to have my tonsils out, buying a book, being allowed to buy what to take to the hospital. So he had books in there too, and some toys." In December 1937 new owner George Cary tried to evict former owner Charlie Call from the second floor apartment he was intending to renovate. It's not clear if he was successful. In February 1938 a major fire next-door at Briggs's store (see Site #31) caused "slight damage" to this building. SW:: He made a little money plumbing. He was in the plumbing business in Edgartown when, I guess he was about the only plumber there in those days. He made a lot of money down there. BW: I think he did a lot of steam heat too, didn't he? Hot water or steam or something? SL: Yeah. A lot of heating jobs, yeah. And then he retired from plumbing and he opened this store up here in Vineyard Haven. BW: Yeah. Charlie had a couple of problems in life, I guess. I guess he and his wife had a bitter separation, and she took everything he had. I think that's when he lost his store and everything. BW: And then he kind of went on the skids. He became an alcoholic and he was a real, well let's say bum, for awhile. Somebody got to him, I don't know who, and he kind of saw the light. In his later years he used to, God he got all cleaned up, and stopped drinking, and cleared up. He didn't do anything, I guess he lived on his little old age pension or something and he reacquired a lot of his self-respect again. Nice guy, I always liked Charlie. BW: Interesting to talk to. Bob Renear bought toys in Calls store. He remembered: "Like a five and ten cent store, a small one. He was a little bit of a character I think." Sam Issokson said: "Charlie Call, he had a hardware store or a gift store. I know he used to have games in there. That was where the Thrift Shop is, or used to be. I used to go in and look around. That's about all. I don't know whether he had very much. The A&P moved in. They were there several years, 'till they got to have a better place down that George Woods built for him." Marge Taylor said: "I remember the Call store. I think he had dishes and house wares, that type of thing." Charles F. Call died in April 1957 at the age of 79 at the State Hospital in Taunton. His death record calls him a divorced plumber. SC: When we used to have the A&P down on Main Street there, you know, we used to bring the list, I used to do the shopping, and bring the list. That's right - you used to go, you'd say 'gimme a bread', they'd go get the bread, 'gimme this', you know, they'd go get that. You give him the list, and he'll do it, and put it in the box, while you're over to the meat counter, you know, getting the meat off that guy over there. See? SL: Today, of course, it's all self-service. I think it's a lot better. You can pick out what you want. In November 1937 Edward G. Cross of Hyannis sold the "Call Block" to Mrs. George W. Cary. The Gazette announced that the Atlantic and Pacific Tea Co. was planning to occupy the building on May 1, 1938. The store was to be remodelled and repaired, and the floor lowered to street level to eliminate the steps outside. The A&P had been operating a branch store in Lane's Block across the street since at least the spring of 1928. (See Site #4.) In December 1937 Art Rodgers and Francis Howes were mentioned as working at the A&P. The new A&P store opened at this location in the last week of April, 1938. PR: "When I remember him he worked in produce [in Cronigs], he was so good." BR: "I remember having a big argument with the man about yams and sweet potatoes. He claimed they were the same thing, I said no, they're different." 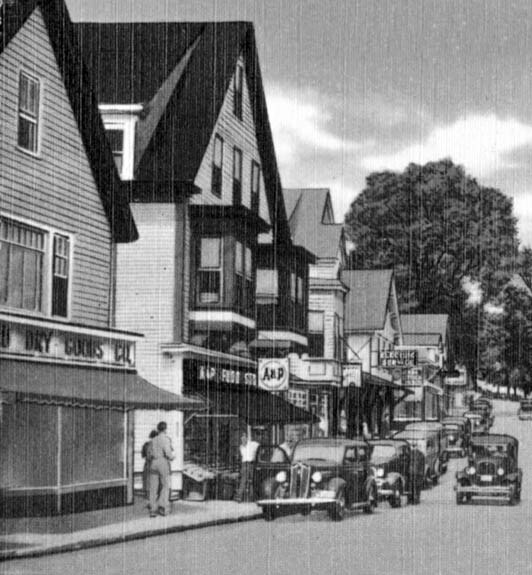 In September 1938 Roger Allen of Hyannis was named the new manager of the Vineyard Haven A&P. In December 1941 John McCall was noted as the meat manager, and Arthur Rodgers the grocery manager. By February 1942 William Luce was employed here. Chandler Lord (son of Arthur B. Lord.) and Sterling Magee worked at the A&P during the summer of 1942. Dana Swift, B. D. Crumlamb, and Ida Swartz are remembered to have worked here, as well as Nonnie (Onnie?) White who had formerly worked at Railway Express. Connie (Frank) Iadicicco recalls: "It was much less efficient than the First National. It was not a very popular store. It was laid out somewhat like the First National, but it was bigger and barer. As you walk in the meat was in the back on the right, and the grocery was on the left. There was very little in the center." In June 1942 the Martha's Vineyard National Bank foreclosed on the mortgage held on this property by Elizabeth M. Cary. The bank assigned the title to attorney Frank Vera of Dartmouth. In November 1943 Vera sold this property to George A. Davis of Los Angeles under a trust in Lina B. Call's name, and in March 1948 Davis sold the property to Leslie M. and Florence L. Flanders of Tisbury. The Gazette reported in April 1948 that the "Call Block" had been sold by Mrs. Lina Call of Edgartown to Mr. and Mrs. Leslie M. Flanders of Vineyard Haven. The building was described then as containing the A&P store downstairs and two apartments upstairs. During the summer of 1948 Robert Howes (son of Theodore C. Howes and grandson of Henry Howes of site #28) worked at the A&P. In November 1951 Kiever McGee was reported as working at here. Bill Wilkinson is also remembered as clerking for the A&P. "George C. Woods, Vineyard Haven contractor, announced to the Gazette on Wednesday, the signing of the lease of his new building on Water Street, Vineyard Haven, by the Great Atlantic and Pacific Tea Company, which will move from its present location as soon as it is completed and equipped. Equipping of the new building will begin about Dec. 15. The new structure is of masonry and steel construction throughout, and of a single story. It contains 4,600 square feet of floor space and the single display window on the front is 24 by 7 feet in area. Forced steam heat is to be installed and the lighting is of the 'continuous strip' variety. The floor is of asphalt tile and the fixtures and equipment will be the latest designs in wood and metal. Thirty-one working days has been consumed up to and including Wednesday, since ground was first broken, which may not me a record for the island but surpassed expectations." "Leslie M. Flanders, owner of the Call Block, so-called, now occupied by the A&P store, could give no information regarding future occupancy of the building. The most he could say was that considerable interest has been shown in the possibility of purchase or rental of the building and he offered the opinion that it will not remain empty longer than such period as may be necessary to re-equip the store." The new A&P opened on Water street in February 1952, complete with an "automatically operating exit door." The Gazette proclaimed that it was "the nearest thing to a supermarket the Vineyard ever had and quite the largest and most attractively appointed." The first purchase was made by Walter C. Woods Jr., two-year-old grandson of builder George Woods, who bought a loaf of bread and package of cereal. Arthur Rodgers continued as manager at the new store. 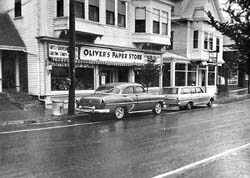 In March 1952 Leslie and Florence Flanders announced the sale of the Call Block to Anthony J. Oliver, proprietor of Vincent's Paper Store (site #27), and his brother John J. Oliver of New Bedford. During the summer of 1954, the Ken-Ward store was located here. In June 1954 they advertised themselves as a "gift and toy center." The new paper store was remodeled and decorated by the Smith Brothers, contractors. The Gazette reported that "The wainscoting, five and a half feet high, is of sheetrock, painted a light brown, and the counters and shelving are of a slightly contrasting shade of the same color. Above the wainscoting, the wall is of peg board, facilitating any sort of light shelving or wall display, and this is of a light marine blue. The ceiling is of acoustics material, and the floor is covered with linoleum." Managing owner Anthony J. "Tony" Oliver (1901 - 1977) was born in New Bedford, the son of John Oliver and Clara Mello of Pico in the Azores. He came to the island in 1920 as a stationery salesman for the F. S. Brightman Co. of New Bedford. In May 1959 Oliver's advertised newspapers, magazines, stationery, gifts, books, games, toys, and greeting cards. In June 1963 they advertised newspapers, magazines, stationery, office supplies, gifts, greeting cards, art supplies, and souvenirs. In March 1973 the Oliver brothers sold this property to William C. "Bill" Haynes of West Tisbury for $95,000. Anthony Oliver retired in 1974 and died in September 1977. Agnes Rice on Tony Oliver: "I remember him. Pleasant enough guy. Kind of a tall, brown-haired, brown-eyed guy. Quiet. He could be very funny with Paul Bangs, and Tom Rabbitt, and Bill Carroll, I think at the time. He was pretty funny with those people. Came from New Bedford. He used to work in that very popular store in New Bedford that has all the writing equipment and stuff, Hutchinson's Bookstore. That's where Oliver came from. He worked in Hutchinson's, and then he moved down here." Bill Haynes ran a gift shop here for a few years during the mid-1970s. 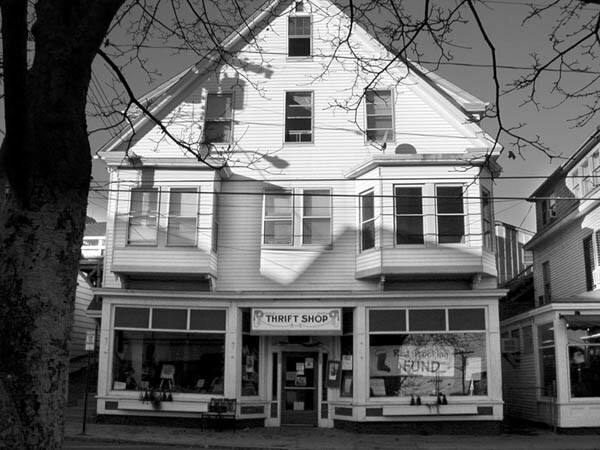 The Thrift Shop was founded by Mrs. Edith Foote from West Tisbury, and by the late-1970s had moved into this building from its former location down the street (see Site #14.) It closed in 2000 and moved to a new location on Lagoon Pond Road.